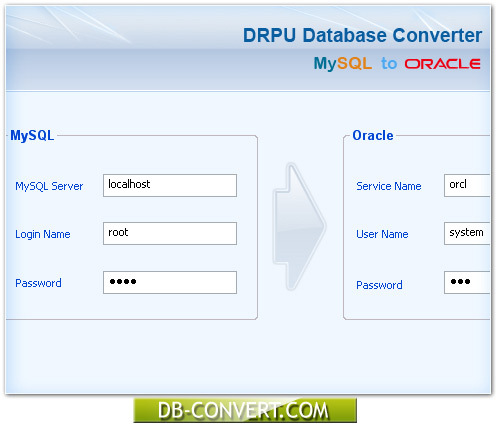 Powerful and easily affordable Database Converter Software provides complete solution to migrate MySQL data base into Oracle database in minimal time. Expertise and specifically designed utility assists database professionals to quickly convert the multiple (mass) MySQL records into Oracle database without the use of database programming. Just simple mouse clicks and convert entire or selected MySQL records into Oracle data base format. Technically advanced database migration tool accurately migrates MySQL database records with support all database key constraints, data types and attributes while converting into Oracle database. Utility maintains the database integrity and all the MySQL database records are maintained in their original format. Accurately convert entire or selected MySQL data base into Oracle database. Supports all required key constraints, data types and attributes of MySQL. Save the created Oracle database records at specified location on the system. Simple-to-use wizard style interface facilitates easy working with the software. Save valuable time by quickly converting MySQL database into Oracle database records. Facility to convert individual MySQL database records. No need to spend money on hiring skilled professionals for creating Oracle database. Supports all major versions of MySQL database.